Vanessa Maltese: Installation views of The Compleat Gamester (2014). Images courtesy Cooper Cole, Toronto. 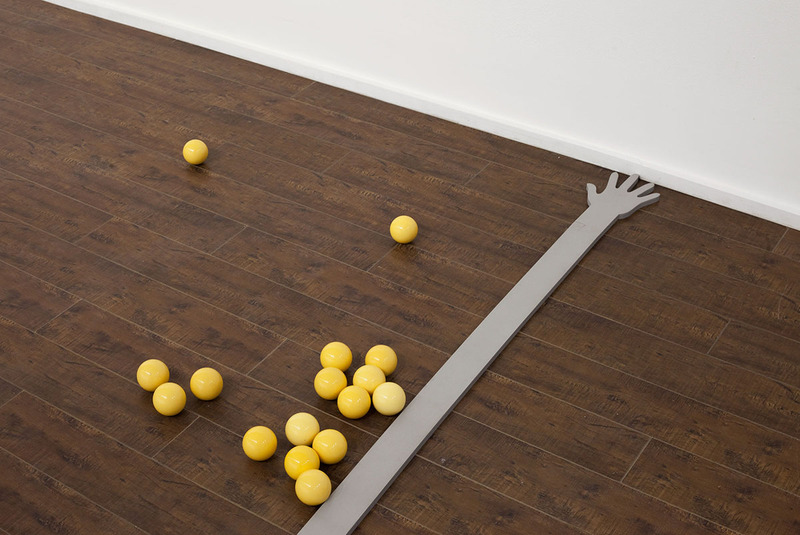 Vanessa Maltese: Installation views of The Compleat Gamester (2014). Images courtesy Cooper Cole, Toronto. 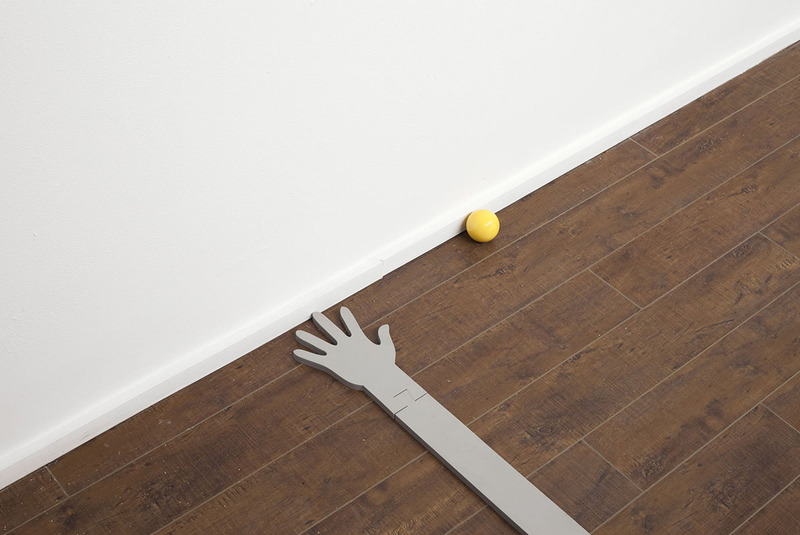 Vanessa Maltese: Installation views of The Compleat Gamester (2014). Images courtesy Cooper Cole, Toronto. For her first solo exhibition at this gallery, Toronto-based Vanessa Maltese, who has made a name for herself as a painter of sharp and smart abstractions, put aside her brushes and presented a minimal, yet surprisingly gallery-filling, installation. With a few deceptively simple gestures, Maltese’s installation, The Compleat Gamester, lead me down a couple of interpretative paths. First, the installation felt like a piece of institutional critique, a sly look at the idea of being ‘allowed’ to interact with art, and how we approach artworks physically and psychologically within the white cube. Observing gallery-goers during the show’s run revealed the level of discomfort some feel in such spaces. Towards the front of the gallery, Maltese seemingly placed a barrier that stopped some people in their tracks. This ‘impediment’ was nothing more than a grey strip of wood with the outline of hands cut into either end lying on the gallery floor. It could have been stepped over easily, but people paused, pulling back their children or picking up their dogs, wondering if they were permitted to proceed through the installation. 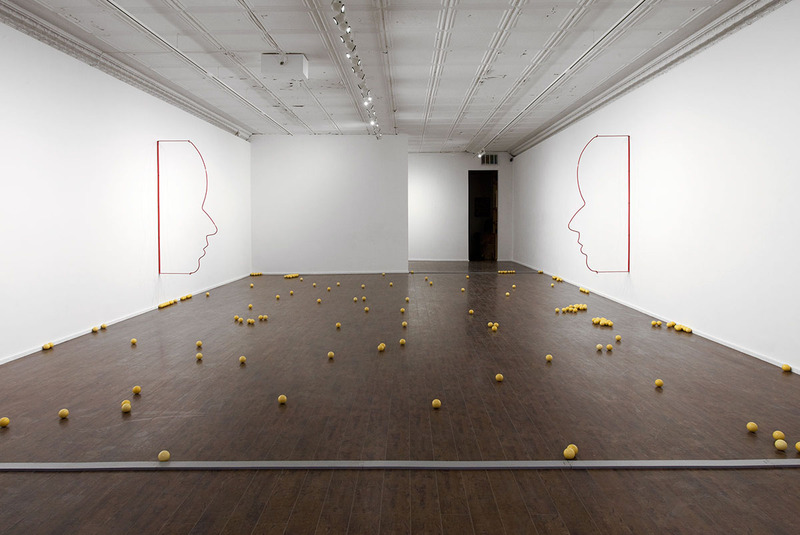 Of course, we were expected to step into the installation, the middle of which contained yellow billiard balls, clustering on the gallery floor, and two large, red silhouettes of men’s profiles hanging across from each other. Once ’inside’, I couldn’t help looking at the display as a metaphor for the art world, the billiard balls amassing in some areas of the floor – like dealers, artists, curators and collectors grouping together in major centres, and forming cliques within them – and the two large profiles as the art world’s gate-keepers – the blue-chip galleries, superstar artists, and jet-setting curators and collectors, making the decisions on what art will be sold, made, seen and purchased, and thereby deemed ‘important’. Standing in the middle of this large ‘game board’, it also crossed my mind that both New York’s Chelsea gallery district and Las Vegas’s casino strip are full of ‘dealers’ – speculating on art on a par with trying your luck at the poker table. Considering the billiard balls further, it also occurred to me that the gallery containing Maltese’s installation is in the middle of Toronto’s rapidly gentrifying Little Portugal neighbourhood. Once home to dozens of smoky and somewhat dingy men’s clubs (containing pool tables, of course), the storefronts now contain galleries, hip bars, coffee shops and restaurants, and independent clothing and design retailers catering to the young couples and families moving into the area. 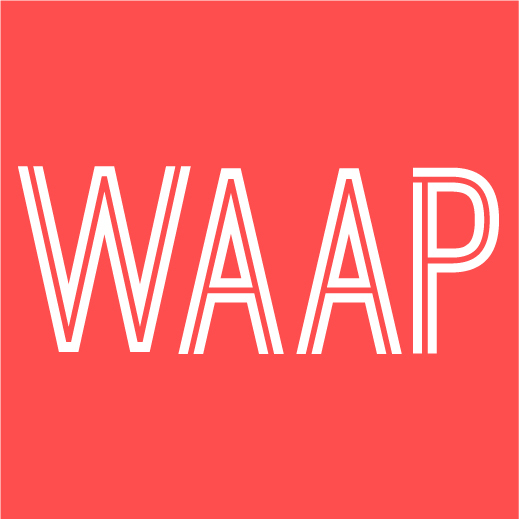 It seems the rules of the games we’re made to play – whether in the art circles we’re part of or the neighbourhoods we frequent – are always changing. Bill Clarke was the Executive Editor of Magenta Magazine Online from its inception in September 2009 until May 2017. His writing has been published in Modern Painters, Art Review, Canadian Art, Artnews and several other publications. In January 2017, he assumed the position of associate director at Angell Gallery in Toronto.